Humans are hardwired to become self-interested killing machines, or at least that was the premise of last night’s episode of The Walking Dead, “JSS,” aka “Just Survive Somehow.” Embrace the killer inside or suppress it, but you will make a choice. After masquerading as a clueless homemaker at Alexandria, abuse victim turned serial survivalist Carol was finally set free. The armory of fucks that once existed in the world, Carol has seized them. The Wolves have savagely invaded Alexandria, killing with no rhyme or reason, and Carol has no choice but to murder them back. The killer’s inside the house. Of course they do. That decision is apparent again when Jessie’s son sees her brutally stabbing a Wolf woman who’s invaded her home, threatening her and her son’s life, and we see another victim of abuse turn. (Notice how the show’s two domestic abuse victims have had latent violent streaks come out.) Even desperate snitch Father Gabriel, having resisted the killer path for so long, now feels obliged to surrender to insanity and choose the direction closest to survival, and so he reaches out to Carl for help. It’s a question that constantly manifests on this show, more in certain episodes than others: whether the truly bad guys (Cannibals, warlords, abusers) should receive mercy. Rick’s group simply thinks no. While I dutifully respect Morgan, killing the Wolves (on sight!) is the most decisive response to this massacre. Other methods would require more—I think too much—discipline that no one has time for except for Morgan, who’s trained to use a stick as a weapon in lieu of a gun. Carol, Rick, Michonne, Glenn and the others have been living by a less ethical philosophy that’s hard to now rewire and I wouldn’t try. However, Morgan is doing a good job of convincing me that negotiation can be somewhat effective. When he encounters a merciless member of the Wolves, he decides to reason with him, explaining that the Wolves should retreat because the Alexandria people have guns: “You keep choosing this life, you will die,” says Morgan, to which the Wolf replies, “We didn’t choose.” Somehow, their murderous lifestyle is a necessary evil to them, but it’s shown in a more barbaric way than anything Rick has done. The Wolves have chosen the shortcut strategy of war-minded individuals who avoid negotiation. Was Rick’s measured takeover of Alexandria a more effective strategy than full-on assault? It’s at least led to an establishment of trust, while The Wolves are more like a cautionary sign of what not to become. Perfect Alexandria has been robbed of its innocence. This time, the Wolves whom Carol hasn’t killed retreat, but surely they’ll be back with a new plan. And those housewives who looked up to Carol earlier on in the episode are dead and gone. The most compelling arc here is the one that frames the entire episode: the quiet release of Carl’s friend Enid. 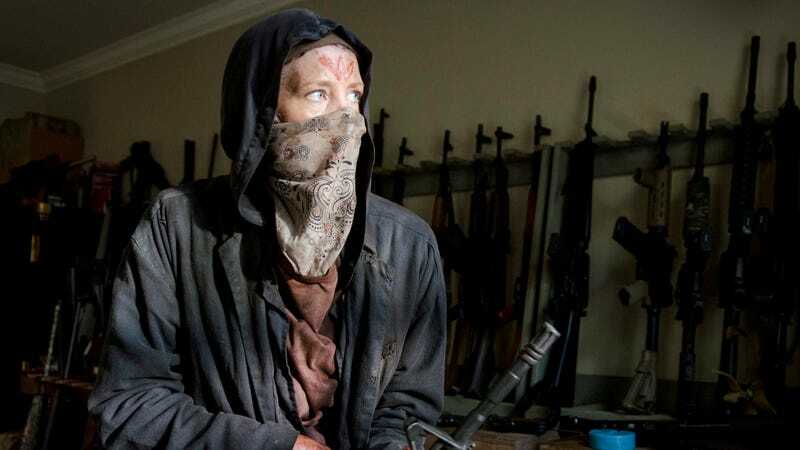 In the opening, she’s seen running around the woods (where she hides from a walker, eats a turtle), somehow surviving on her own before she happens upon Alexandria. Enid, who maybe doesn’t feel like home, tells Carl that she’s leaving. When she mentions Alexandria’s “blind spots” (and subtly hints that she knows more about the Wolves than she’s let on, perhaps as a former insider), Carl is too busy yapping to realize she has this advantage. On the surface, it seems like an unwise idea to ditch the comfort of community. Not when you realize that the comfort is just a façade. No, I wouldn’t go because I’m a scaredy cat, but Enid’s shown an impressive level of strength for her age (she’s seen comforting Jessie’s eldest son at one point) and for her it’s worth it to escape a broken community for the choice of making it on her own. Her chances of survival are high.